The Spring Festival is a major event that includes the Castle Festival and Dogo Onsen Festival. The Castle Festival is set around the heart of Matsuyama castle whilst the cherry blossoms are in full bloom. The festival grandly unfolds with three days full of various events, beginning with the citizens dressing in the traditional attire of Japanese feudal lords and warriors, and parading through the city's downtown area in a traditional feudal procession.The Dogo Onsen Festival is a popular event that offers a taste of the old spa town of Dogo. The Castle Festival and Dogo Festival are held on separate days. The summer festival, counted among the four main festivals of Shikoku, is the largest event of the summer. 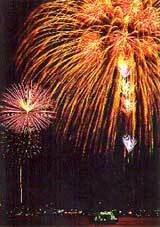 It is opened with the night sky being painted with a brilliant display of fireworks, and the succession of events is held with a distinct Matsuyama flavor. Samba, folk singing, rock music, various genres of music combined, and dancers fascinate the spectators for three days. The Summer Festival includes the Matsuyama Festival and Matsuyama Port Mitsuhama Fireworks Festival, which are held on separate days. The autumn festival is carried out as a celebration of the grain harvest. Before the light of dawn, all Shinto shrines throughout the area are visited, and people dressed in the traditional happi clothing are seen parading through the streets carrying portable Mikoshi shrines. 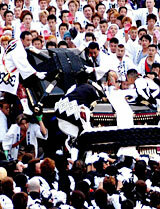 The most striking event of all is the way the Mikoshi teams clash with one another. Athletes from around the nation gather to compete in this three part competition by swimming, running, and cycling among the serene natural surroundings. Festivities are held on the day before the tournament, with the area being packed with the participants and spectators . During mid-October at the Kunitsu Hiko no Mikoto shrine, the traditional breaking of the Mikoshi shrine takes place. The Mikoshi shrine is dropped from the top of the stone stairway and all the young people scramble to be the first to catch the sacred object which symbolizes the shrine's god, as it breaks from the portable shrine.